Cross the line first. The industries original dry lubricant. 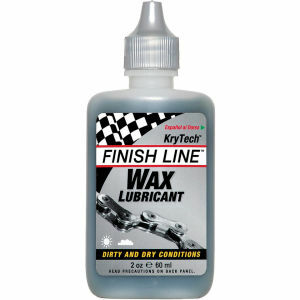 Finish Line Teflon Dry Lube 60ml Bottle. Goes on wet, but then sets up in a dry, paste-like film so it will not attract or absorb grit and grime. Perfect for on or off-road riding, especially in dry, dirty, dusty conditions, while still providing adequate wet weather performance. I always use this as my summer lube and the fact it came free with my order is great. Sometimes the basic lube does the best job. Seems to be good. Easy to use lubricates well. Came in a massive box for the product but thats the only concern so it can't be bad. Appears to work quite well, only time will tell. Rather thin which concerns me slightly and also means you need to apply it carefully. I've been using finish line lubes for years now and I would wholeheartedly recommend them. Especially at half price! Had to stock up! I reapply probably once a week (I ride 3 times a week on average). Keeps the chain pretty clean, although that's not to say you're not gonna need to keep on top of your cleaning and maintenance!! Recommended!